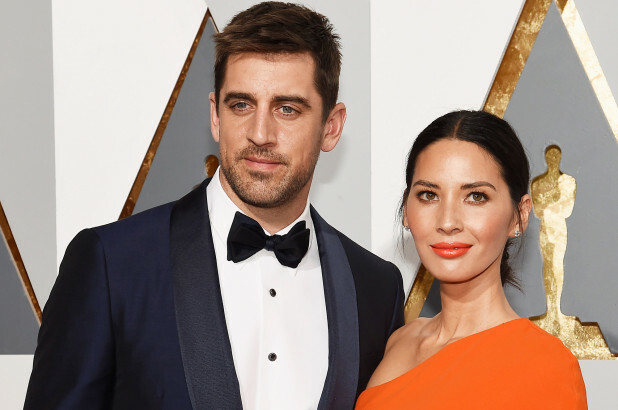 Having been part of Aaron Rodgers’ life for three years, Olivia Munn knows the ups and downs of the quarterback’s personal affairs, namely the frosty relationship with his family. Munn denied being the source of the family drama, which had been suggested, instead saying she was trying to help put the family back together. “My last day on ‘The Newsroom’ I spent my day in the trailer just encouraging him to have an open conversation with his parents, and they had a really nice conversation and then they started coming out my first year in Green Bay in 2014,” Munn said. Despite hope of a slight thaw within the Rodgers clan, tensions appeared to surface again in 2016, when the quarterback’s younger brother, Jordan, competed on “The Bachelorette.” Bringing home future fiancée JoJo Fletcher to meet the family, Jordan noted his relationship with Aaron was essentially non-existent. “I have a great relationship with my [older] brother, Luke. Me and Aaron don’t really have much of a relationship,” Jordan said on the show. Though Aaron chose not to air his dirty laundry publicly, father Ed, a sports chiropractor, doubled-down on son Jordan’s claims. Munn believes her ex’s lofty status complicates things for all parties involved. “I do believe that family and fame and success can be really complicated if their dreams are connected to your success,” Munn said. “They [the Rodgers family] are all into sports and Aaron is one of the best, if not the best, quarterbacks to play the game. Their work has a direct connection to what he does. Though she and Rodgers no longer keep in touch, following their breakup last April after three years of dating, the youngest member of the Rodgers clan is keeping the door ajar for Aaron, where his future wedding is concerned. Should Aaron accept an invite one day, new girlfriend Danica Patrick could very well be his plus one.